– The act of replacing high-priority actions with tasks of lower priority, or doing something from which one derives enjoyment, and thus putting off important tasks to a later time. – To voluntarily delay an intended course of action despite expecting to be worse off for the delay. – Chronic procrastination may be a sign of an underlying psychological disorder. Such procrastinators may have difficulty seeking support due to social stigma, and the belief that task-aversion is caused by laziness, low willpower or low ambition. 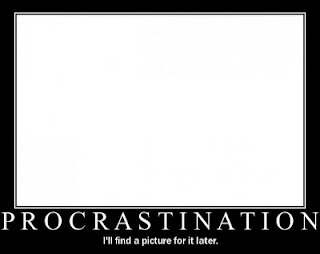 My latest form of procrastination: googling the term ‘procrastination’ instead of editing my story. So I probably should get back to it and stop all this procrastinating!